9/26/17 Episode 310 (the season finale) recap is posted. Thanks for reading! 9/19/17 Episode 309 recap is here. Hope you like it! 9/12/17 Episode 308 is ready to be read, improv addicts. 9/5/17 Episode 307 is up for your reading pleasure. 8/29/17 Episode 6 recap is live. Enjoy! 8/22/17 Episode 5 recap is here. Have a read! 8/15/17 Check out the Episode 4 recap, which is now up! 8/8/17 I decided to post the recaps for Episode 2 and Episode 3, in case North Korea decides to go ahead and bomb us. THANK YOU, DONALD TRUMP. 8/8/17 Episode 1 recap is here! Check back tomorrow for Episode 2 and Thursday for Episode 3. The first three episodes will be available to stream on August 8! Get your binging snacks ready and come back here to read my recaps next week! Julie faces a moral dilemma when she gets cast in Woody Allen’s new TV show; Billy and Marilyn scam their way through a government gay conversion therapy program. Matthew’s ex-wife comes to town. After maxing out on antidepressants, Julie is armed only with a meditation app as a family Passover Seder approaches; Billy lands a job as a warm-up comic for Larry Wilmore's late-night talk show; Arthur goes to Florida for work. 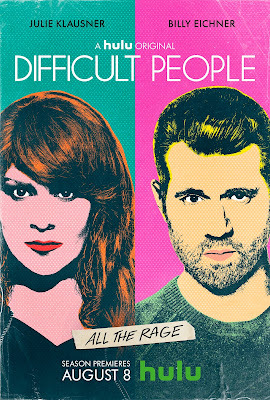 6/22/17 Get ready, basset aficionados/PBS nerds/Broadway babies because Season 3 of Hulu's Difficult People will return on Tuesday, August 8, 2017. And I'll be recapping all the hilarious episodes right HERE! "The upcoming third season of Difficult People finds Julie (Julie Klausner) and Billy (Billy Eichner) remaining each other’s best friends while still their own worst enemies. Julie embarks on a season long quest for happiness, after she learns if she tries to up her anti-depressants anymore her blood will be a Slurpee, trying in the process everything from meditation to ayahuasca. Meanwhile, Billy begins to sour on New York, just as he begins to fall for his first real boyfriend (John Cho). Marilyn (Andrea Martin) lands a book deal, and Arthur (James Urbaniak) is forced to commute to the Burt Reynolds Dinner Theatre in Jupiter Florida, where PBS has moved all of its productions." Leave a comment for Kim here. © 2018 Kimberly J. Bowman. Simple theme. Theme images by luoman. Powered by Blogger.